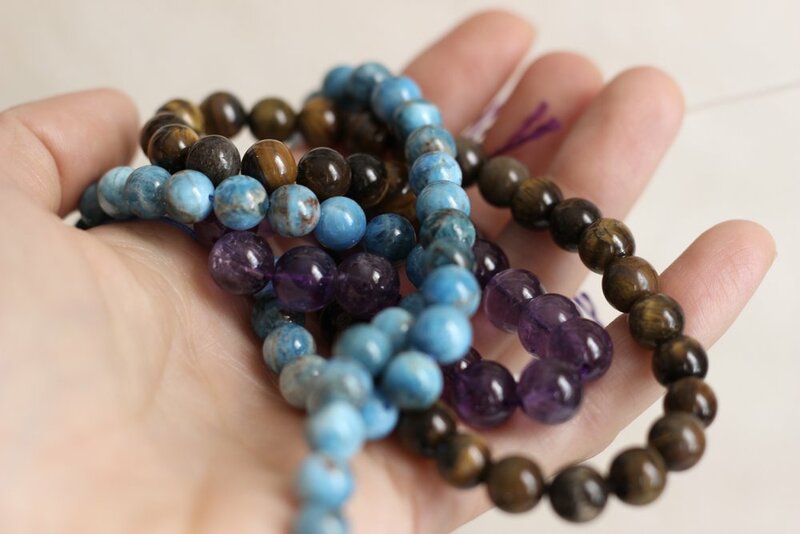 Tiger Eye, Amethyst, and Blue Apatite make the perfect combination for our November focus on Energy and Efficiency! Tiger eye contains a natural balance of sun and earth energies, providing high vibrations, as well as grounding. Amethyst is one of my favorite focus and inspiration crystals for creatives, and Blue Apatite provides motivation and drive. Just like our focus oils, these crystals will help you say, "I've can totally do this! Let's get down to business!" • Increase Focus and use logic, rather than emotion, when facing obstacles. • Find inspiration, increase creative problem solving, and connect to higher thought. • Remain calm and level headed during stressful times. • Avoid stress symptoms such as brain fog and headache. • Enter a meditative state for doing your morning affirmations or resetting during mid-day. • Maintain a positive outlook, drawing off negative thoughts about yourself and others. • Keep a clear head and boost your creativity. • Stay inspired. This is a stone of Manifestation, helping you tune into your desired future and bring it into your present. • Communicate effectively, through clearing and healing the throat chakra. We will be using our Energy Boost Necklaces for all of our Daily Intention Setting this month. You can pre-order your Energy Boost Necklace now, so you'll get the benefits all month long!